Today Is Election Day For The United States, But Everyday Is Election Day For Internet Marketing And Your Business. Are you making your Business-to-Business or Business-to-Consumer vote count on the Internet? Is your business up to the task of providing valuable information on the Internet? Will your company make a difference in its small or large market segments crowd? Or, will your company disenfranchise your target audience? Your website is an extension of your business on the Internet. As such, are you really taking the opportunity of the publicity that could be generated through the process of providing information to future customers? The Internet is about votes and campaigning for votes. The more votes generated by users online the higher your online search standing will be. The Internet has voids or holes that need to be filled. For example, information about certain topics is very limited except in very narrow market segments. Many times the information is only in the heads of a few company owners rather than written down in a hard or soft copy format. Why are you holding back? I believe most times a business holds back from publishing an article is not because they are concerned about sharing proprietary information, but because it simply takes a certain amount of effort to get their butts in gear and write an article in the first place. Most items that are of a proprietary nature can be encapsulated in generalities instead of the sharing of specific information. This is an opportunity to set the standards in your particular industry. Set your company’s brand apart from the rest of the B2B or B2C crowd, as being the expert in what ever specific field you are in. Writing an article does not necessarily mean going into a long discourse, but the sharing of information in a well thought out format that will engage the reader and not make your readers bored. In an article by Chuck McKay, The Fifteen Minute Effective Business Letter, Chuck gives practical advice for writing a good business letter. Well, that advice could also be taken to heart for writing an effective article online. Think of writing online as the extension of your business. Communicate with your customers and future customers with a respect for their time they deserve, by highlighting the important information fist. Give a summary of your important points first. Throw out the formal writing styles and put it into the way you personally communicate with customers. Most potential customers around the Net are not interested in wasting their time reading something that sounds like it came from their College English Professor. A picture of the product, service, or even your company logo can very easily be included in an online article using any of the free professional blogging softwares that are available. The blogging software can be integrated into the business website itself, so the article could reside directly at the company’s website host and be edited at anytime in the future. Writing the article, and publishing it online provides valuable benefits toward your company’s Internet marketing strategy. Research is never ending for engineers and consumers. Getting the article in the right hands can provide valuable natural links from other website owners. Through the process of writing the article online, then actively promoting that same article through Internet marketing strategies can bring in substantial new customers than ever before. Part of the Internet marketing strategy could include search engine marketing through a Pay-Per-Click advertising program with the various search engines. Think of the article that was just written as a specific landing page for a target audience. Using the Pay-Per-Click advertising program, an ad can be displayed in the search engine results pages with a very specific target audience in-mind. Then, anytime an engineer or consumer searches for the terms that are selected as search keywords, your company ad could show up in the paid results. Once an article has been published online, it has the potential to become voted on by others on the World Wide Web. This voting takes place through natural links that would be generated on other websites to your published article. This voting by others in the form of links, helps establish the article as providing valuable information and therefor, the search engines will rank the article accordingly based on this factor and others. So, start writing your articles today. Professional Web Services can help get you started. Contact us for Internet marketing services today. What are the advantages and disadvantages to implementing business 2 business or consumer keywords and keyword phrases in the website that are seldom used? There are two online schools of thought here. One SEO school says that the keywords selected to be used throughout the website should be the least competitive keywords and misspellings included, so it is much more likely to be found in the search results. The other SEO school says to develop the natural keywords throughout the website along with logical variations of keyword phrases including plural uses of the keyword and various tenses using proper writing syntax and grammar. If we follow the first SEO school, a website may start showing up in the top results for very seldom searched for keyword phrases. While in the other SEO school, because of the numbers of pages with the same keywords, web pages are less likely to show up due to excessive competition. Actually, I believe that both SEO philosophies have ideas that are both right and wrong. First and foremost, I believe the emphasis should be on natural language writing and logical uses of the keywords. This will no doubt require extensive research, reading, and writing of quality content. It will certainly take an extended period of time to make a marketing impact in the various keyword market segments. At the same time, it is important to also develop other lesser used variations of those keywords and keyword phrases to help establish an online site theme or a type of Internet marketing trend in what a website is about. In essence, you have to write the way your customers think for the search engines to pick up on the keywords and keyword phrase syntax used throughout the website. Are There Search Engine Optimization Shortcuts? SEOs have used extensive Black Hat search engine shortcut tactics in the past for getting a website to the top of the search results. As search engine algorithms have improved, these black hat optimization tactics are becoming less effective. The emphasis today should be on developing good content, proper link building throughout the website, proper titles and meta tags, ethical search engine optimization strategies, unique marketing and advertising messages, and certainly strategic link building with various related topics and websites. How Should we Measure Search Engine Software Algorithms? No search engine company is going to come out and tell you exactly what is required to get your web page or website up to the top in the search engine results. Though they will give you some best practices guidance for webmasters to follow. First off when it comes to the Internet presence, every search engine company wants to have the best results possible. If a search engine tells you exactly what to do, then everyone would try to do the exact same thing. There are a multitude of variables involved in page ranking, that are factors in attaining top standing in the search results. We can not control what Google, Yahoo!, or Microsoft Bing Search do in their search algorithms. So, what we can control is the content and layout of websites under our control. The number one goal of any website should be to provide quality content to get found online. Algorithms and software improvements at the Search Engines have made great strides in evaluating keywords throughout the page and site, along with Natural Language Processing (NLP), Text Analysis, and Automatic Classification Systems are some of the key areas for establishing what a website is all about. The days of just pasting a whole bunch of keywords over the entire page or hiding the keywords in the underlying html code to get a website in the top search results is all but over. Sure, there still are websites in the search results list that do this type of Black Hat SEO tactic, of hiding keywords, but that is only because other parts of the software algorithms might give higher Page Rank [Google PageRank™] to these pages based on the number of pages that link to them on the Internet. Read more insights into the Google PageRank perspective. It becomes exceedingly difficult for Search Engines to say how much is too much for certain types of keywords in the body text. There are an infinite number of variables for establishing the density of a keyword. Certainly, the difficulty becomes even greater when one considers the use of certain words having different meanings for different industries. Then there is the aspect of how the word is used in the context of the text itself. Natural Language Writing has different styles, such as Argumentative, Narrative, Enunciative, and Descriptive Styles; along with different uses of grammar and even the proper spelling and even misspellings can significantly alter how a search engine responds to the classification and Keyword Density of the page. What Additional Factors are used in Keyword Analysis? Search Algorithms need to be able to filter through all of the other words in a website. Every single word that is placed on a web page can have some degree of influence over the whole of the page and even the website itself. Simple words like: them, your, you, it, or, AND even and, need to be filtered and evaluated. Too many uses of those words in the web page can throw off the algorithm. Relationships exist between all words. The proximity of the Online words relative to each other, will also significantly influence the software algorithms of what the page is about (See Keyword Graph.) Writing on the Web has to be tightened up and more structurally focused toward the subject matter, in order to become more successful in establishing new pages online, especially when it comes to the highly competitive Internet keywords. To grasp the degree of difficultly that Search Engines face in cataloging a website is to consider what needs to be analyzed from their perspective. By somewhat of a Reverse Engineering Marketing aspect we can gain Internet marketing insight into what is looked at for establishing the ranking in the search engine results pages. Capitalization, bold text, font size, and font placement are all factors in page analysis. For example: as Google Search algorithms have improved, and certainly expanded over time to include other on-site and off-site website factors, the weight factor given to each of these hundreds of variables has changed slightly, and in some instances drastically affected the search results. I believe that we are all on an online marketing learning curve. Search engines are continually learning about the World Wide Web by constantly traveling the Net with their Robots that catalog the pages. Then with analysis software, the companies can determine the so-called Mean, Mode, and Median of any particular criteria within the page or group of search results they wish to analyze. With such detailed analysis, they then can tighten or loosen a set of parameters to slightly change or drastically change the search results. Every update to a search engine algorithm in-turn creates a new round of learning by all the SEO Webmasters of the world. Through this type of online school teaching, the SEO is constantly being trained toward better content writing and layout quality. The whole of search is also trained, because as creativity and new technology are implemented into websites, along with the popularity of other types of online content sites, the search companies can continue to upgrade and improve their algorithms to reflect these new changes. Sure, there may be the law of unintended consequences that occur along the way, but in the long run, everyone will benefit with better content, websites, and search engine results pages. Professional Web Services, Inc., is a SEO strategies, Internet marketing services, online advertising strategies, and a Web branding solutions company. Contact us today for Internet Marketing Services for your B2B or B2C business to be found in the search engines. Turn your business into a great online sales tool with a Pro. 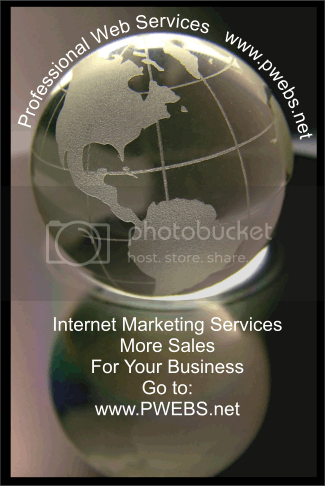 eBusiness Online marketing solutions with Professional Web Services. If you are serious about gaining more customers now, getting more online sales leads, and learn how we can help your business get discovered on the Web, then send us an email today for your online marketing solution.